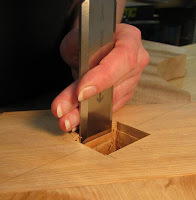 There are two beefy mortise and tenon joints (read: lots of room for error, if you're like me) that support the stretcher on the sawbuck table. The mortises are 1.5" (w) x 2" (h) x 1.375" (deep) and the tenons are almost 5" long. 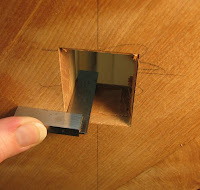 I laid out the mortises using a cardboard template to ensure that both would align correctly, then removed the bulk of the wood with a forstner bit chucked into my drill press. 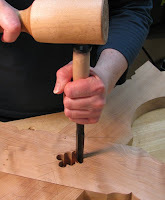 A mortising chisel removes chunks of wood in short order and a paring chisel cleans up the sides of the mortise. 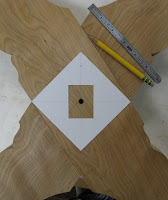 I worked from both sides of the leg assembly and checked for square along the way. If you pare from both sides, often a crown is created in the middle of the joint, which is revealed by a square. 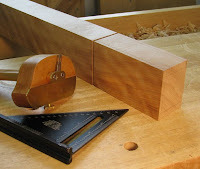 To layout the tenon, I used a slicing gauge to incise lines on the end and on all four sides and defined the shoulder with a chisel before roughing out the shape on the band saw. 1) The rasp quickly removes band saw marks a nd 2) I have never been able to make my Stanley shoulder plane work properly. It's demon-possessed. No, really. That's the only possible explanation.